Product #692 | SKU BERX1602 | 0.0 (no ratings yet) Thanks for your rating! Extremely flexible keyboard and multi-purpose sub-mixer, multi-track monitoring mixer, level translator, FX return sub-mixer, etc. The RX1602 comes equipped with all the necessary features to create the right mix for your sound. 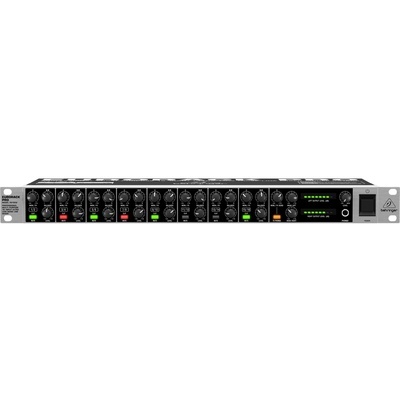 The 16 high-headroom inputs (8 stereo, 8 mono) can be used for individual line level instruments or component outputs. The ULN (Ultra Low-Noise) design’s high headroom means you can run up to 16 HOT inputs without clipping – and at the same time be assured that there won’t be any extra noise added by the mixer. Each channel has its own balance and level controls, as well as illuminated double-function “mute” buttons with “clip” LEDs to help you avoid distortion. You also get highly accurate dual 7-segment LED level meters and an individual level control for left and right main mix signals. For further flexibility, the Monitor/FX signal is assignable to headphones. It all adds up to transparent, crystal-clear audio performance.